Being responsible stewards of our environment is a core value of Stetson University. In June 2007, on behalf of Stetson University, President Doug Lee became a Charter Signatory with the American College & University Presidents Climate Commitment. An Environmental Stewardship Plan was put in place and endorsed by our Board of Trustees. That plan includes targets toward achieving our goal of being carbon neutral, action steps, periodic measurement and reporting of our results. Use only the amount of lighting required. Turn lights off when leaving offices, classrooms, residence hall rooms, etc. Turn off computers, screens and printers when not in use. Take advantage of the power management settings of computers, printers, copiers, etc. Be aware of and manage “plug load.” Computers and appliances have capacitors that consume energy even when the devices are not on. Either unplug the device or turn off the power strips when leaving offices or rooms or when sleeping. Unplug electric chargers for devices when they are not in use. Adjust temperature settings to 75 degrees for cooling; 68 degrees during heating periods. When leaving the space for periods exceeding several hours, overnight, weekends, or semester breaks, adjust the thermostat to 82 degrees during cooling and 55 degrees during heating periods. Set thermostats to the automatic setting instead of ‘on’ where possible. Turn fans, space heaters and the like off when leaving your office, room or classroom. Keep windows closed during heating and cooling periods. Keep exterior doors shut to prevent the entry of unconditioned, humid air. 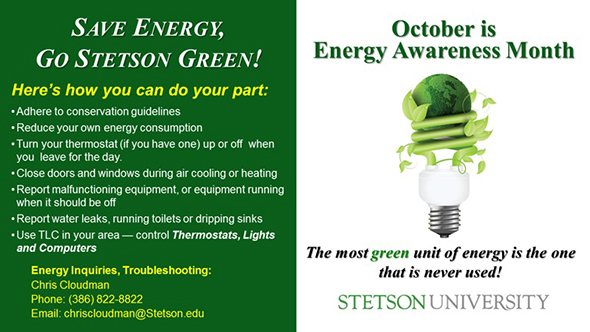 In celebration of Energy Awareness Month, members of the Stetson community are encouraged to visit the Carlton Union Building steps in DeLand on Oct. 15 and 16, to pledge their support, meet the campus Energy Specialist and Environmental Sustainability Fellows and receive an Environmental Stewardship t-shirt.